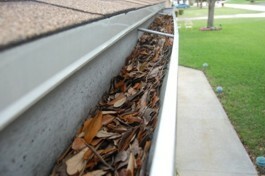 Gutters and Downspouts need to be clear and free of debris to allow water to flow properly. Over time debris in the form of leaves, shingle granule, dirt and concrete tile build up and need to be removed. Downspouts need to be checked that they are clear to allow water to shed away from the foundation. Downspouts that are near shrubs and vine type plants can allow roots to grow up through the downspout. 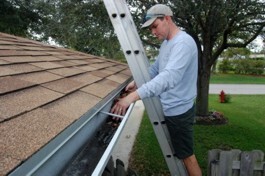 Cleaning of your gutters can include, scooping out by hand, blowing out with a blower or using water from a hose. This can be a messy job, but don't worry we'll clean up after ourselves! We have a fully equipped seamless gutter machine that is capable of making gutter to any length. 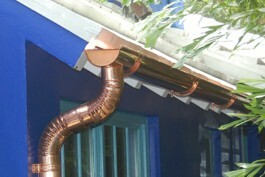 We can professionally install new seamless gutter and downspout on your home or business. Cooler and dryer weather is here. Leaves and debris can pose a fire danger. Are your rain gutters ready? 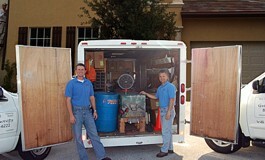 Give us a call and we can clean and inspect them for you. Atlantis . . . Boynton Beach . . . Boca Raton . . . Briny Breezes . . . Broward County . . . Coconunt Creek . . . Davie . . . Deerfield Beach . . . Delray Beach . . . Ft Lauderdale . . . Hallandale . . . Highland Beach . . . Hollywood . . . Lantana . . . Jupiter . . . Lake Worth . . . Loxahatchee . . . North Palm Beach . . . Parkland . . . Palm Beach Gardens . . . Palm Beach . . . Pembroke Pines . . . Pompano Beach . . . Sunrise . . . West Palm Beach . . . Weston . . . Tamarac . . .